OCLC Online Computer Library Center, Incorporated d/b/a OCLC  is an American nonprofit cooperative organization "dedicated to the public purposes of furthering access to the world's information and reducing information costs". It was founded in 1967 as the Ohio College Library Center. OCLC and its member libraries cooperatively produce and maintain WorldCat, the largest online public access catalog (OPAC) in the world. OCLC is funded mainly by the fees that libraries have to pay for its services (around $200 million annually as of 2016 [update] ). OCLC also maintains the Dewey Decimal Classification system. An online public access catalog is an online database of materials held by a library or group of libraries. Users search a library catalog principally to locate books and other material available at a library. In simple language it is an electronic version of the card catalog. OPAC is the gateway to library's collection. Ohio University is a public research university in Athens, Ohio. 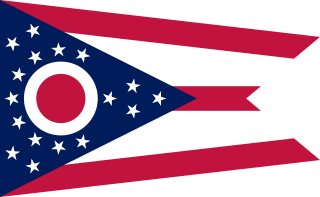 The first university chartered by an Act of Congress and the first to be chartered in Ohio, it was chartered in 1787 by the First Continental Congress and subsequently approved for the territory in 1802 and state in 1804, opening for students in 1809. Ohio University is the oldest university in Ohio, the eighth oldest public university in the United States and the 30th oldest university among public's and privates. As of 2016, the university's total enrollment, including all campuses, was more than 36,800. OCLC and its member libraries cooperatively produce and maintain WorldCat—the OCLC Online Union Catalog, the largest online public access catalog (OPAC) in the world. WorldCat has holding records from public and private libraries worldwide. The Open WorldCat program, launched in late 2003, exposed a subset of WorldCat records to Web users via popular Internet search, bibliographic, and bookselling sites;  Open WorldCat later morphed into WorldCat.org. In October 2005, the OCLC technical staff began a wiki project, WikiD, allowing readers to add commentary and structured-field information associated with any WorldCat record. WikiD was later phased out. 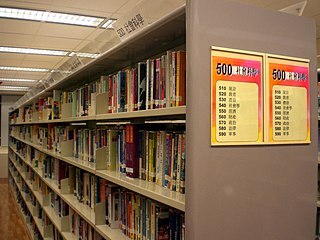 The Online Computer Library Center acquired the trademark and copyrights associated with the Dewey Decimal Classification System when it bought Forest Press in 1988. A browser  for books with their Dewey Decimal Classifications was available until July 2013; it was replaced by the Classify Service. Until August 2009, when it was sold to Backstage Library Works, OCLC owned a preservation microfilm and digitization operation called the OCLC Preservation Service Center,  with its principal office in Bethlehem, Pennsylvania. The reference management service QuestionPoint  provides libraries with tools to communicate with users. This around-the-clock reference service is provided by a cooperative of participating global libraries. OCLC has been conducting research for the library community for more than 30 years. In accordance with its mission, OCLC makes its research outcomes known through various publications. These publications, including journal articles, reports, newsletters, and presentations, are available through the organization's website. WebJunction  is a division of OCLC funded by a grant from the Bill and Melinda Gates Foundation, which provides training services to librarians. 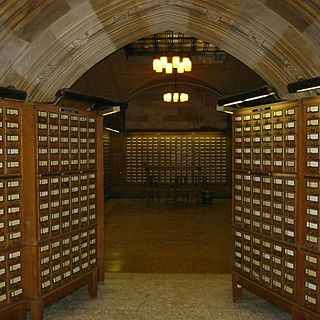 The Dewey Decimal Classification (DDC), colloquially the Dewey Decimal System, is a proprietary library classification system first published in the United States by Melvil Dewey in 1876. Originally described in a four-page pamphlet, it has been expanded to multiple volumes and revised through 23 major editions, the latest printed in 2011. It is also available in an abridged version suitable for smaller libraries. OCLC, a non-profit cooperative that serves libraries, currently maintains the system and licenses online access to WebDewey, a continuously updated version for catalogers. Interlibrary loan is a service whereby a patron of one library can borrow books, DVDs, music, etc. and/or receive photocopies of documents that are owned by another library. The user makes a request with their home library; which, acting as an intermediary, identifies libraries with the desired item, places the request, receives the item, makes it available to the user, as well as arranges for its return. The lending library usually sets a due date and overdue fees of the material borrowed. Although books and journal articles are the most frequently requested items, some libraries will lend audio recordings, video recordings, maps, sheet music, and microforms of all kinds. In some cases, nominal fees accompany the interlibrary loan services. RedLightGreen was a database of bibliographic descriptions on the Web created by Research Libraries Group (RLG). It used a set of four million records extracted from OCLC's WorldCat database, and was designed to help novice users make selections from the vast bibliographic resources they would encounter in such a large set. RedLightGreen also allowed users to create citations for works found. The Research Libraries Group (RLG) was a U.S.-based library consortium that existed from 1974 until its merger with the OCLC library consortium in 2006. RLG developed the Eureka interlibrary search engine, the RedLightGreen database of bibliographic descriptions, and ArchiveGrid, a database containing descriptions of archival collections. It also developed a framework known as the "RLG Conspectus" for evaluating research library collections, which evolved into a set of descriptors used in library collection policy statements, last updated in 1997. The Library of Congress used the conspectus in 2015 in the revision of its own collection policy statement, and decided to retain this resource on its website, as a helpful scale for judging an academic collection's depth. Eureka was the user interface for general users of the Research Library Information Network (RLIN), a bibliographic resource containing records from libraries that were members of Research Libraries Group (RLG). Eureka had the capacity to search among approximately 45 million different titles. Most of the catalog was from major research libraries and museums in the United States. Despite the OPAC formulation, Eureka technically was not a public access search engine. It was generally accessible only from networks connected to research institutions such as universities. OAIster is an online combined bibliographic catalogue of open access material aggregated using OAI-PMH. ArchiveGrid is a collection of over five million archival material descriptions, including MARC records from WorldCat and finding aids harvested from the web. It contains archival collections held by thousands of libraries, museums, historical societies, and archives. Contribution to the system is available to any institution. Most of the contributions are from United States based institutions, but many other countries are represented, including Canada, Australia, and the United Kingdom. ArchiveGrid is associated with OCLC Research and helps to advance their goals of making archival collections and materials easier to find. ArchiveGrid is described as "the ultimate destination for searching through family histories, political papers, and historical records held in archives around the world." LibraryThing is a social cataloging web application for storing and sharing book catalogs and various types of book metadata. It is used by authors, individuals, libraries, and publishers. 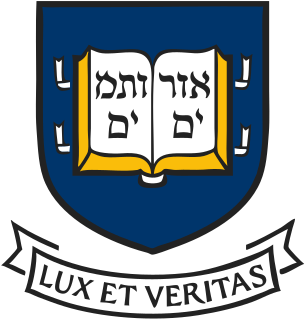 The Harmer E. Davis Transportation Library —also known as the Institute of Transportation Studies Library (ITSL), the Berkeley Transportation Library, or simply as the Transportation Library— is a transportation library at the University of California, Berkeley, devoted to transportation studies. Frederick "Fred" Gridley Kilgour was an American librarian and educator known as the founding director of OCLC, an international computer library network and database that changed the way people use libraries. He was its president and executive director from 1967 to 1980. The International Coalition of Library Consortia (ICOLC) is an informal, self-organized group of library consortia from around the world; it exists for strategic and practical discussion of issues of common interest among the consortia members. The ICOLC first met informally as the Consortium of Consortia (COC) in 1997. Over time, its name was adjusted to reflect its increasingly global character. Faceted search is a technique which involves augmenting traditional search techniques with a faceted navigation system, allowing users to narrow down search results by applying multiple filters based on faceted classification of the items. A faceted classification system classifies each information element along multiple explicit dimensions, called facets, enabling the classifications to be accessed and ordered in multiple ways rather than in a single, pre-determined, taxonomic order. The New York Art Resources Consortium (NYARC) consists of the research libraries of three leading art museums in New York City: The Brooklyn Museum, The Frick Collection, and The Museum of Modern Art. With funding from The Andrew W. Mellon Foundation, NYARC was formed in 2006 to facilitate collaboration that results in enhanced resources for research communities. Called a groundbreaking partnership, NYARC also provides a framework for collaboration among art research libraries. 1 2 3 2015/2016 OCLC annual report. Dublin, Ohio: OCLC. 2014. OCLC 15601580. 1 2 "OCLC Consolidated Financial Statements 2015–16" (PDF). OCLC. September 12, 2016. Retrieved May 28, 2017. ↑ "Certificate of Amendment of Articles of Incorporation of OCLC, Inc. and Amended Articles of Incorporation of OCLC Online Computer Library Center, Incorporated". Ohio Secretary of State. February 6, 1981. Retrieved May 28, 2017. ↑ "About OCLC". OCLC. Retrieved 2017-05-28. 1 2 "In the beginning" . Retrieved 2012-08-28. ↑ Intner, Sheila (March–April 2007). "The Passing of an Era". Technicalities. 27: 1–14. ISSN 0272-0884. ↑ Bates, Marcia J; Maack, Mary Niles, eds. (2010). Encyclopedia of library and information sciences. V (3rd ed.). Boca Raton, Florida: CRC Press. p. 3924. ISBN 9780849397127. OCLC 769480033. ↑ Bailey-Hainer, Brenda (October 19, 2009). "The OCLC Network of Regional Service Providers: The Last 10 Years". Journal of Library Administration. 49 (6): 621–629. doi:10.1080/01930820903238792. ISSN 0193-0826. ↑ O'Neill, Nancy (Nov–Dec 2004). "Open WorldCat Pilot: A User's Perspective". Searcher. 12 (10): 54–60. ISSN 1070-4795. OCLC 201889986. ↑ "WikiD". OCLC. Retrieved March 5, 2015. ↑ "OCLC DeweyBrowser". deweybrowser.oclc.org. Retrieved May 28, 2017. ↑ "Preservation Service Center". OCLC. Archived from the original on December 29, 2003. ↑ "QuestionPoint". OCLC. Retrieved May 28, 2017. ↑ "OCLC prints last library catalog cards". www.oclc.org. October 1, 2015. Retrieved May 28, 2015. ↑ "CONTENTdm". OCLC. Retrieved May 28, 2017. ↑ "WorldCat Discovery". OCLC. Retrieved March 11, 2019. ↑ Hyatt, Shirley; Young, Jeffrey A. "OCLC Research Publications Repository". D-Lib Magazine. 11 (3). doi:10.1045/march2005-hyatt. ↑ "OCLC Publications" . Retrieved 2012-08-28. ↑ "OCLC Membership Reports" . Retrieved 2012-08-28. ↑ "OCLC Newsletters" . Retrieved 2012-08-28. ↑ "OCLC Presentations" . Retrieved 2012-08-28. 1 2 3 Rosa, Cathy De (October 22, 2009). "Advocacy and OCLC". Journal of Library Administration. 49 (7): 719–726. doi:10.1080/01930820903260572. ISSN 0193-0826. ↑ Grossman, Wendy M. (January 21, 2009). "Why you can't find a library book in your search engine". The Guardian. ISSN 0261-3077 . Retrieved 2017-05-28. ↑ "WebJunction". Oclc.org. Retrieved 2014-04-30. ↑ "Advocacy: From Awareness to Funding, the next chapter". 2018-07-18. ↑ "Inside WorldCat". Online Computer Library Center. Retrieved February 11, 2018. ↑ "Open WorldCat". Worldcat.org. Retrieved 2014-04-30. ↑ Wallis, Richard (September 24, 2013). "OCLC Declare OCLC Control Numbers Public Domain". ↑ "OCLC Control Number" . Retrieved 2014-01-03. ↑ HangingTogether.org (October 11, 2013). "OCLC Control Numbers in the Wild". ↑ Jordan, Jay (March 17, 2010). "Letter to members 2010". OCLC. Archived from the original on March 26, 2010. ↑ Rogers, Michael (October 30, 2007). "CLC/OCLC Pica Merge". Library Journal. New York. Archived from the original on October 28, 2008. ↑ Wilson, Lizabeth; Neal, James; Jordan, Jay (October 2006). "RLG and OCLC: Combining for the Future" (guest editorial). Library and Information Science. Vol. 6, no. 4. Retrieved via Project Muse database, 2017-06-21. ↑ "RLG to Combine with OCLC" (press release). OCLC Worldwide. May 3, 2006. worldcat.org. Retrieved 2017-06-22. ↑ Price, Gary (January 13, 2015). "Print Collections: OCLC Acquires Sustainable Collection Services". Infodocket. Retrieved March 6, 2015. ↑ "OCLC agrees to acquire Relais International to provide library consortia more options for resource sharing". January 17, 2017. Retrieved May 16, 2017. ↑ Beall, Jeffrey (2008). "OCLC: A Review". In Roberto, K.R. Radical Cataloging: Essays at the Front (PDF). Jefferson, NC: McFarland & Company. pp. 85–93. ISBN 0786435437. OCLC 173241123. ↑ Coyle, Karen (July 29, 2010). "SkyRiver Sues OCLC over Anti-Trust". Karen Coyle. ↑ Breeding, Marshall (July 29, 2010). "SkyRiver and Innovative Interfaces File Major Antitrust Lawsuit Against OCLC". Library Journal . Archived from the original on August 2, 2010. ↑ Price, Gary (March 4, 2013). "III Drops OCLC Suit, Will Absorb SkyRiver". Library Journal . Bénaud, Claire-Lise; Bordeianu, Sever (October 2015). "OCLC's WorldShare Management Services: a brave new world for catalogers". Cataloging & Classification Quarterly . 53 (7): 738–752. doi:10.1080/01639374.2014.1003668. Wikimedia Commons has media related to OCLC .